Strong---It was solid-built sturdy and carry weight well. Convenient to use---Hanging both sides of this item up, hang your clothes, then drop down one side. Super Space Saving---7 clothes hang on 1 organizer,it takes up no more space than a shirt.It is good for those with limited closet space and overcrowding closet. 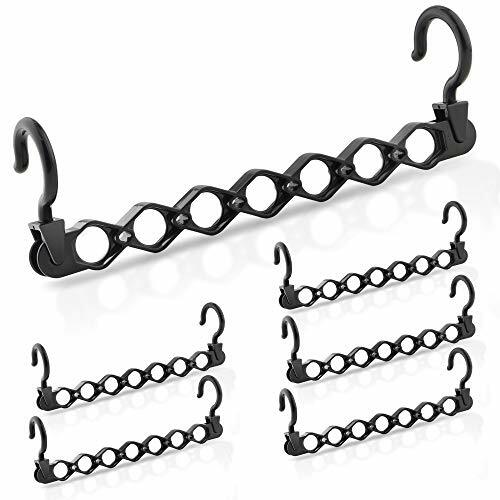 Quality Heavy Duty Hangers---Their hook won't break like other similars.Hangers are made by thick solid plastic.Durable enough to hang heavy winter coats,shirts,dresses,pants, and children clothes. Multi Clothes Hangers in One---Hang 7 garments on a single organizer,one set can hold up to 42 garments.Ideal for apartments, dorms, small houses. Product Diemnsion---Fit closet rod diameter within 1.2 inch;When horizontal: 12.5" (L) x 4" (H),when Vertical: 18.3" (L). Keep Clothes Organized---Keep clothes neatly arranged and wrinkle free. 100% Risk Free Purchase---3 years warranty. If you have any questions about this product by IPOW, contact us by completing and submitting the form below. If you are looking for a specif part number, please include it with your message.